The Casio G-Shock Gravitymaster is like any other wristwatch; it tells the time anytime no matter where you are in the World without having to do nothing. It is hard to classify this as a smartwatch but it is sure one of the most efficient in the basic thing every watch was made to do, and that is to tell time. This watch does it so well; you don’t have to do anything to set the time when you move from one place to another it does it for you. One of the reasons it was made was to respond to the needs of pilots and other personnel for watches with improved accuracy, strength, and practicality. It has extensive use of carbon fibre material used in making aeroplane frame to provide the tough performance need to withstand the irregularities originating from altitude and speed encountered in the cockpit during flights. A smartphone feature has been incorporated into the device to ensure acquisition of the accurate time required for airtime operation and precise time correction in every location and environment. It has a smart flight Log feature that allows you to drop a pin at a certain location (record your location which is then used to track your flight path) by pressing a button at 5 o’clock. It as a bright LED illumination system that brightens up the screen and a lumped face as well as a built-in solar power supply to help maintain constant power. The watch also has a one of a kind latitude and longitude display system that shows you the exact place you at and when the watch pings a GPS signal. 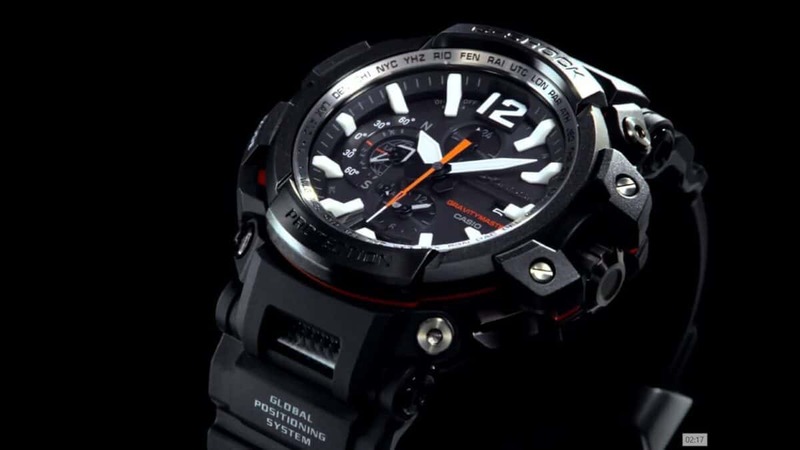 The G-Shock Gravitymaster has a massive bodywork that seems like it can survive being run over by a heavy-duty truck. It is neither a smart nor is it an analog watch with the app powered dual time readout and latitude and longitude output. It has GPS and other systems in place to ensure that the calendar and time settings are always accurate no matter your location in the world. Casio which is a brand dedicated to the perfect watch idea that requires no intervention from its users to provide reliable and accurate time and date. There is also no need to charge the battery as it charges itself using sunlight or even ambient light. The watch offers a triple redundancy function designed to make sure the time is always precise. To get the time right, the watch has to reference external information, which it does in three ways. Firstly, it might get the necessary information using Bluetooth to ping a paired smartphone time to check internet time. The new GP2000 is shock resistant, Triple G resist (shock resistant, centrifugal force resistance and vibration resistant) and 200M water resistance.